The answer is not quite as simple as you might think. There are a few reasons we recommend adding a spa to a swimming pool. 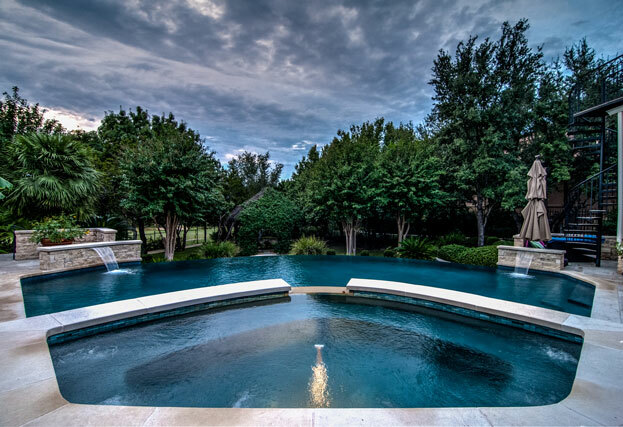 First, by adding a spa to a pool that is primarily used in the warmer months, the pool now becomes a year round investment, that can be used in the cooler months as well. Secondly, with the addition of a spa, you have the ability to heat the pool if you so desire by flipping a valve and using the heater. Keep in mind this will take a toll on your gas bill should you try to heat the entire pool, especially in a frigid temperature. The last and usually most important reason for building a spa with your pool are the therapeutic values it offers. Inquire with your pool builder about installing a hydrotherapy tube and extra jets for your calves and feet. This will take the therapeutic ability of your spa to the next level. Now to address the cost associated with the building a spa in concert with a swimming pool. When we add a spa to a swimming pool build it typically incurs an additional cost of around $11,000 to start. There may also be some additional cost associated with the gas line necessary for the heater, that’s why you should keep the equipment as close to the homes gas meter as possible. Ask your pool builder if you can pay for the gas line directly to the subcontractor as this will save you some money. Keep in mind a large pipe is required to feed the 400kBTU heater and often your gas meter will need to be upgraded by your utility company at no cost to you. Included with your spa package would be the largest residential heater available 400kBTU, and a computer control system. For efficiency make sure you have the 400k heater, it will save you a lot of heat up time and money due to efficiency. We also recommend iphone/android controls for your swimming pool when you add a spa. There is nothing like being able to heat up the spa from your phone on your way home from a hard day of work or play. As far as upgrades go, remember to talk to your swimming pool builder about extra pumps, jets, and a hydrotherapy tube to make your spa the ultimate relaxation destination.